Ballymacnab edged a 6 goal thriller against Madden on Saturday evening to confirm their spot in the semi final in this year’s championship, where they will face the winners of Armagh Harps and St Patrick’s Cullyhanna. It was a Jack Grugan point in the 61st minute which sealed victory for his side, with Grugan notching 2-4 throughout the game, 2-3 coming from play. Ballymacnab opened the scoring with Captain Brian McCone pointing with their 3rd attack. Madden won the resulting kickout and levelled the game with their first shot through Conor Grimley. A Michael Beagan turnover in the Nab’s defence led to a counter attack which ended in a Paul Kennedy point. 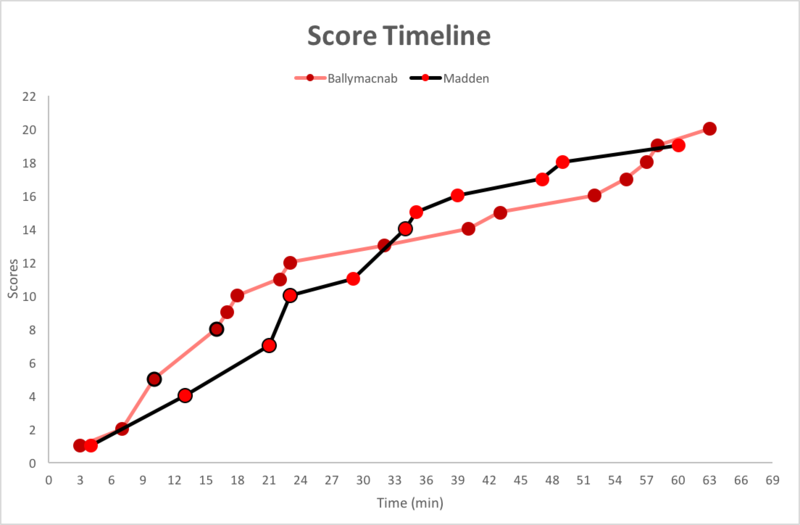 Ballymacnab’s defence were on top in the early stages, turning Madden over 4 times in the opening 7 minutes. Pauric Gribben produced an attack 4 minutes later with a mark from his side’s own kickout. A high ball into the square was fumbled by the Madden goalkeeper only for Jack Grugan to tap home the simplest of finishes. Madden then grabbed a 3 pointer of their own, with Aaron McKenna palming the ball into the net after good work from Conor Grimley to leave 1 point between the teams. 3 minutes later Ballymacnab extended their lead with Grugan once again finding the net after a diagonal pass from his brother Rory. The Nab started to take control with points from Rory Grugan and Gavin McParland leaving the score 2-4 to 1-1, 3 of their scores coming off the back of winning the Madden kickouts. Just when Ballymacnab seemed to be pulling away, Madden reduced the deficit with another goal, through a wonderful Conor Grimley effort after Ciaran Rafferty’s shot had dropped short. Ballymacnab lost their full back Brendan Toner during this play, after he sustained a serious shoulder injury, leading to a 11 minute stoppage with the score now at 2-4 to 2-1. 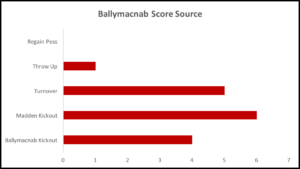 Ballymacnab dominated both sides kickouts, winning 100% of their own while also gaining possession from 5 of the 7 Madden kickouts. It was a Ballymacnab kickout which led to their next attack, with Jack Grugan once again splitting the posts. Grugan won the resulting kickout to set up Paul Kennedy who extended their advantage to 5 points. Madden again responded in terrific fashion, this time Donal Rafferty rattling the back of the net after a great run through the heart of the defence. Niall Grimley then scored his first of the evening with a converted free just before half time to leave his side trailing by the minimum of margins with the score 2-6 to 3-2. Out of the Nab’s 8 scores in the first half, 75% of them came from kickouts, with 2 coming from the 12 turnovers in defence. 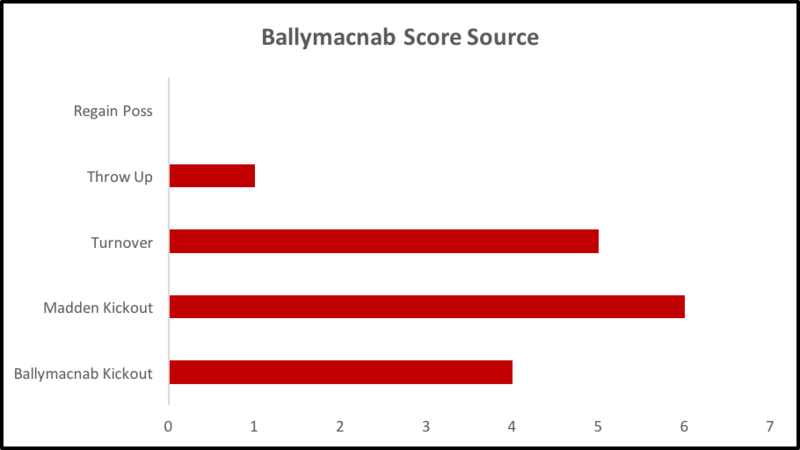 Ballymacnab controlled the kickouts in the opening half winning 13 out of 18 restarts. Leading to 19 attacks which gave them the opportunity for their 13 shots on goal, converting 62% of their chances. 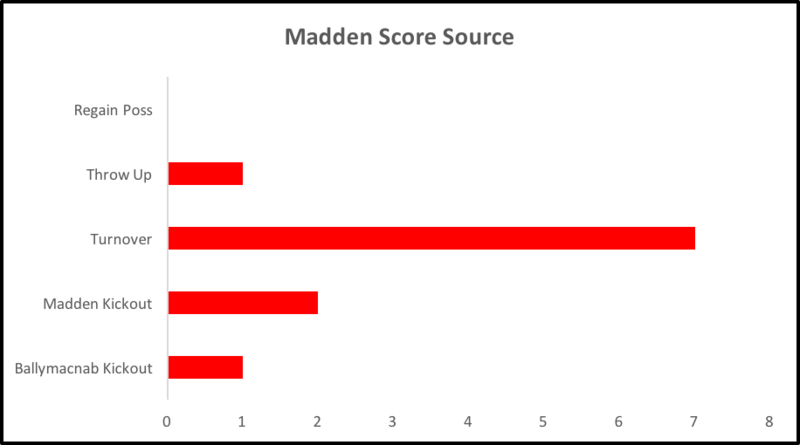 Madden’s best chance of scoring came through their ability to turn the ball over, producing 4 of their 5 scores. 4 of their scores came from play. 8 of their 17 turnovers in the first half came in the middle of the field, compensating for only winning 5 kickouts (2/9 of their own kickouts). Madden converted 42% of their scoring chances, dropping 3 shots short while also kicking 4 wides. Ballymacnab once again started the brightest with the Grugan brother linking up for Rory’s second point of the game. Madden then pushed ahead for the first time in the 3rd minute of the half, when Aaron McKenna netted from the penalty spot to leave the score 4-2 to 2-7. McKenna grapping 2 of the Madden goals. Ryan Grimley won the resulting kickout in the middle of the park, setting up Conor Grimley to edge his side further ahead before McKenna again struck, this time knocking the ball over the bar, to leave Madden 3 points in front. The Nab soon closed the gap with the Grugan brothers again coming to the fore, scoring a point apiece. A Niall Grimley turnover produced another counter attack for Madden with the reliable McKenna once again splitting the posts. 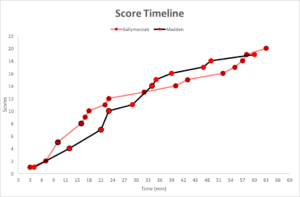 This however would be Madden’s final score until the 29th minute as Ballymacnab began to find their feet. Rory Grugan set up Gavin McParland for a point before another Michael Beagan turnover led to McParland kicking his second in 4 minutes. The Nab won the resulting restart, providing the chance for Jack Grugan to score, 6 of his sides’ scores now coming off of Madden kickouts. Brian McCone then nudged his side in front with a point before Kyle Morgan once again levelled the game from a counter attack, Donal Rafferty with the turnover. With the sides level and now entering the injury time, Jack Grugan once more stood up to drive his side to victory, his effort sailing over to leave the score 2-14 to 4-7. Although Madden had chances to level proceedings they never took the opportunity, leaving Grugan as the hero with his side now marching on to the semi finals. 10 of the Nab’s 16 scores came off the back of kickouts, winning 26 of the 38 throughout the game. They dominated their own kickouts winning 11 of the 15. Their best opportunity to win their own kickout came from kicking it short, as the 4 that they lost to madden all came from long restarts, while they won 10/11 of them short. 7 of Madden’s scores came from turnovers, as they turned their opponents over 28 times. 15 of these coming in their own defensive third while also having 12 turnovers in the middle of the field. Madden will be disappointed not to create more shooting opportunities having converted 52% of their shots. Kicking 5 wides, 4 short while one of their efforts was also saved. Ballymacnab: Conor McGivern, James Gray, Brendan Toner, Chris Loughran, Michael Beagan, Ryan Kennedy, Oisin McGivern, Pauric Gribben, Rory Grugan(0-3), Ruairi Gribben, Jack Grugan (2-4), Paul Kennedy (0-2), Gavin McParland (0-3), Finnen Maguire, Brian McCone (0-2) Subs: Damien McGeown for B. Toner, Ryan Watters for F. Maguire, Ciaran Connelly for C. Loughran, Brendan Gribben for R. Gribben. Blood Sub: D. McGeown for F. Maguire. Madden: Patrick Woods, Kieran Grimley, Mark Quinn, Donal Rafferty (1-0), Niall Smith, Ryan Morgan, Barry Mallon, Liam Grimley, Ryan Grimley, Conor Grimley (1-3), Niall Grimley (0-1), Ciaran Rafferty, Conor Morgan, Aaron McKenna (2-2), Peter Lappin. Subs: Cillian Mallon for C. Morgan, Kyle Morgan for C. Grimley, Colin Mallon for A. McKenna, A. McKenna for R. Morgan, Jamie Sheridan for M. Quinn.